One of the leading causes of traumatic brain injuries in the United States is motor vehicle traffic crashes, accounting for 20 percent of all cases. Traumatic brain injuries (TBIs) and head injuries affect 1.4 million people each year in the United States; they are responsible for about 50,000 annual fatalities. TBIs occur when a sudden trauma causes the head to shake violently, or strike an object, or be impaled on an object—with the result of physical damage to the skull or brain. Depending on the force and damage, the severity of TBIs varies from mild (bruising, slight swelling) to severe (skull fractures, brain herniation, and death). The force of a truck accident can cause passengers (of the truck or another vehicle involved in the crash) to strike their heads on dashboards, seat backs, and windows. This impact can lead to severe damage to the skull, which can then ultimately expose the brain to further damage. A simple fracture. Also known as a “closed fracture,” this is when there is a break in the bone and no damage is done to the skin. A compound fracture. Also known as an “open fracture,” this is when there is a break in the skin exposing splintered bone. A depressed fracture. This is when the skull is crushed inward, toward the brain. A linear fracture. This is a crack in the skull that is a straight line; it does not distort the bone. Although there are four different types of fractures, they’re all extremely dangerous and should be treated immediately to prevent further TBI risks. In some cases, the impact of a truck accident can cause the brain to swell as it is bounces of the inside of the violently moving skull. This swelling—along with potential bleeding—can cause excess pressure to build up in the skull and force brain tissue to move out of place or become compressed. This compression is known as a brain herniation. It can lead to strokes, permanent brain damage, or even death. If you or someone you love has been in an accident at the hands of a negligent truck driver, you need to know that resolving brain herniation is often arduous and potentially life-threatening. In severe cases, doctors have to take drastic measures in order to stop further damage from occurring. A surgeon may have to remove part of the skull to give the brain room, place a drain in the brain to remove cerebrospinal fluid, or remove blood and blood clots to stop the swelling. If you experience any of the above symptoms following a truck accident, it is imperative that you seek medical attention immediately. In fact, if you struck your head—even if it was a shallow impact—don’t wait for the symptoms to occur. See your doctor and request an MRI or brain scan to rule out any internal damage that may have occurred. It can take time to come to understand the full effects of a brain injury. But, just as you should not delay seeing a doctor, you should contact an attorney as soon as possible. Attorney Steve Lee is an experienced truck accident lawyer and knows how important it can be to act quickly in these cases. 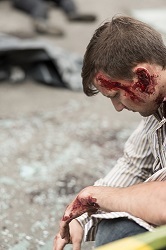 If you or a family member has suffered a head injury from a truck or car accident, you may be entitled to financial compensation from the driver or trucking company. Contact attorney Steve Lee today at 713-921-4171 or 800-232-3711 for a free consultation and discussion of your rights and options. Treatment for a brain injury can be expensive and ongoing. Don’t pass the chance to receive a little financial help and comfort by filing an injury claim. Call now!